This program is designed to help your dog learn and practice basic skills such as crate training, sit, come, down, and go to bed. We also focus on good manners like not jumping up, sit when greeting someone or at a gate and other fun self control games. Start your puppy off on the right paw ! During this program, the puppy will learn skills that will help them grow up into a happy, well mannered dog. We will work on crate training, name recognition, come, sit, stay, leash walking, manners as well as nail cutting. We will introduce puppies in a positive way to our well behaved dogs to help socialize the pup. My two children (8 and 5) will help with child socialization for the pup. Is your dog a little 'fluffy'? Does he get tired easily? Like humans, dogs need exercises too!. From puppy to senior, from couch potato to the canine athlete, there are fun exercises to help improve your dogs overall well being. Besides the incredible physical benefits, doing these exercises will provide mental stimulation, strengthen the bond with your dog, increase dog's confidence and create more focus. Plus it is really fun to do!! When signing up for this program, your dog will be exercised using safe and fun fitness equipment ! Do you want to show off how smart your dog is by doing fun tricks? During this program, we will teach your dog various tricks! It is great fun for dogs but also helps to build confident smart dogs.The American Kennel Club now recognizes Tricks as an official titling class. 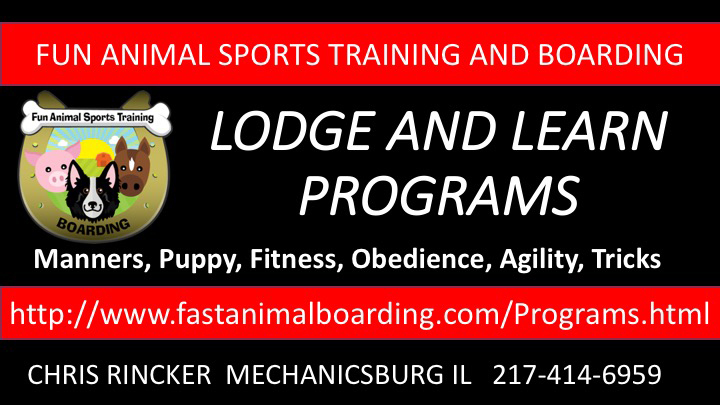 So we can help you learn tricks to earn AKC titles. This program focus' on agility. Agility is a fun dog sport that involves running your dog through an obstacle course. You can choose various divisions within this program including foundation agility skills, obstacle skills and sequencing. Here is a video of some puppy learning !